COTY success evades BMW again despite engaging dynamics and refined drivetrains. Last year saw BMW's smallest hatchback morph into BMW's smallest coupe and convertible. There's more to come on the 1 Series front - a X1 mini off-roader and even a sedan are on the cards - but for the moment, the extensive re-engineering work to turn a five-door into two two-doors was more than enough to give them COTY eligibility. With the likes of the 120i Convertible weighing in at just $52,900, sales far exceed COTY's requirement of at least 250 units per annum. On the COTY catwalk - where judges got to poke, prod, sit in, examine and learn about the cars before driving them - the 1 Series duo got a qualified nod of approval. The proportions are a little weird thanks to a high roof, stumpy boot and long bonnet, the latter to accommodate an in-line six. The 135i shouts its intentions with an M-Sport bodykit. Better than adequate rear leg room led the 190cm Poppitt to describe the packaging as "pretty bloody good", although others were less enthusiastic about available head room in the coupe, or the rear-seat narrowness of the convertible enforced by the folding roof mechanism. Our selections from the range started with the 2.0-litre four-cylinder 120i and 3.0-litre six 125i Convertibles through to the 125i Coupe and brawny 135i turbo six Coupe. Given the latter is being favourably compared with past M3s, its $72,230 price tag seems relatively affordable, but against other respected chop-tops like the VW Eos, the Convertible's (up to $80,000) sticker seemed excessive. Driving any BMW should be a joyful experience, and on the whole, the latest 1 Series variants didn't disappoint. Sheer performance from the 135i was tempered by the atmo engine's absolute smoothness, and its useful balance of power and precision in what is, after all, a relatively lightweight and short wheelbase car. "Love that engine" said Stahl, and although noting the 135i's "knuckly" manual gearbox action, declared it "one hell of a package". Electronic stability control was adjudged to be finely attenuated on any model, acting promptly on the slippery dirt section but not shutting down forward progress completely. Or, it could be completely switched off if needed. Not that this was such a good idea in the 135i on the bitumen handling sections; its 225kW and 400Nm in less than 1500kg of car constantly tested traction. We treated the roofed and roofless models as separate variants, but did the convertibles lose out in any way to the coupes? The weight penalty is around 100kg, boot space is reduced by 65 litres with the soft-top in place (or 110 litres folded) and on the whole, judges found the relatively small loss of body rigidity acceptable. "Not a lot of evidence of scuttle shake with the roof down," Newton surmised. So, no gripes with the 1 Series Coupe or Convertible? Well, there were a few niggles, and they added up. I'm not a great fan of the ride, which is supple enough up to a point but quickly runs out of suspension travel and becomes harsh over really rough stuff. Or perhaps it's those standard run-flat tyres. 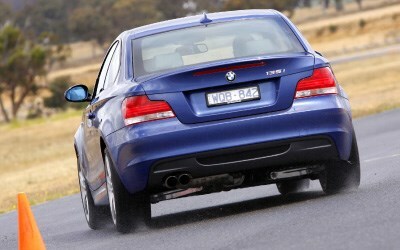 Robbo bemoaned the "heavy steering at low speeds" (whereas Poppitt loved "the heavy, meaty steering") and the twitchy, powerful 135i felt "a bit too much engine for the package," according to Bulmer. That's not taking into account a spooky chain of problems with the 1 Series variants we tested. The seat height adjustment broke in one of the cars, but it was the 120i Convertible that was worst affected. The lower control arm on its right front suspension went banana-shaped, leaving the front wheels pointing cockeyed in two directions. It probably bounced badly off something on the dirt loop, but to so comprehensively bend a substantial component without anyone noticing the hit seemed strange and disconcerting. Both variants scored highly on safety, with the obvious exclusion of curtain airbags on the convertibles, although its side bags offer head and thorax protection, and they have natty pop-up roll-over protection behind the rear seats. Environmentally, it is slightly above average thanks to the lack of mass and the most popular variant - the 120i Convertible - having a relatively efficient engine. But both the 1 Series Coupe and Convertible missed the cut. There's no doubt they are exciting cars to drive, especially those with larger engines, and the 125i Coupe was universally praised as being the sweetest of the bunch. Doubts over value, rear-seat accommodation and ride comfort caused judges to mark the 1 Series twins about mid-field, and there was polarisation about whether the powerful 135i was as well-rounded as BMW's best coupes. And to progress to the next round of Car of the Year 2008 that just wasn't quite good enough.